Recently, I attended the Connecting Leaders Conference: Learning for Changing Times in Richmond, BC. This is a yearly conference put on by our British Columbia Principals’ and Vice-Principals’ Association (BCPVPA). I signed up for this conference in August and was patiently waiting for the day to come! The day was full of great connections, questions, and thoughtful reflections (thanks Chris, Darcy, Trevor, Scott, and the #SD36 crew). What more can one ask for when being involved in professional development? 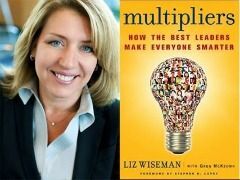 In our Friday keynote, Liz Wiseman talked about her book, Multipliers: How the Best Leaders Make Everyone Smarter. What a great title for a book! To say I was intrigued, is an understatement. Who doesn’t want to be a great leader? I was interested in hearing what Liz had to say. Liz Wiseman divided leaders into to categories: Diminishers and Multipliers. She states that Diminishers are leaders who “are absorbed in their own intelligence, stifle others, and deplete the organization of crucial intelligence and capability.” These people always need to be the smartest people in the room. They operate under the assumption, “People won’t figure it out without me.” According to Wiseman, there are five disciplines of the Diminisher: 1. The Empire Builder, 2. The Tyrant, 3. The Know-It-All, 4. The Decision Maker, and 5. The Micromanager. Diminishers are those who make negative comments, are critical but not constructive, can be condescending, and focus only on mistakes. These are the leaders who continually make you feel inadequate. According to a study by Wiseman, et. al., as a result of these characteristics, the Diminisher actually gets less than 50% of their employees effort and results. Mulipliers, on the other hand, are “genius makers and bring out the intelligence in others. They build a collective, viral intelligence in organizations.” These leaders operate under the assumption that “People are smart and will figure it out.” According to Wiseman, there are five disciplines of the Multiplier: 1. The Talent Magnet, 2. The Liberator, 3. The Challenger, 4. The Debate Maker, and 5. The Investor. These leaders find what people are naturally good at and put that to work. They have high standards and ask people to solve hard challenges. They make people uncomfortable, but in a safe environment. They are empowering and allow (encourage) risk-taking and they value the opinions of others. The result is that a Multiplier can get twice as much work/effort from an employee as the Diminisher. So, where do you fit in? Are you a Diminisher or are you a Multiplier in your leadership style? To be honest, I can see myself as a Multiplier in many ways, but I can also see myself as an Accidental Diminisher, in different situations. I often find myself “Rescuing” others. It is a fine line though, as we discussed at our table group, between providing support or rescuing. Some people need support, while many (Wiseman would say, most) just come to their leaders for an ear to listen to their issues and to let the leader know what is on their mind and how they are going to work through it themselves. They are not coming for any answers. In fact, answers drag them down. What they need, is questions. As we learned from Wiseman, questions can help clarify ones thoughts and feelings and can help bring others to important realizations on their own. I can actually see myself in many of these “accidental diminisher” characteristics. At times, I see myself as a “Rapid Responder” and really need to slow down in some areas. Furthermore, if you have read my blog much, I think you’d probably agree that sometimes I can be “The Optimist” always believing there is a way to solve any problem that may come up. I try not to get weighed down by negativity, but, instead, look at things positively. I must remember though, that others may perceive this as being something that it’s not – overly self-confident, perhaps? The awareness of how I may be accidentally diminishing others is powerful and extremely important. One of my goals will be to stop being a “rescuer”. Ask more questions. Really deep, meaningful questions. Questions that will get to the underlying why. So, my question for you . . . can you be an accidental diminisher to one person, but a multiplier to another? Is it always just one or the other? My thought is, if you are accidentally diminishing one person, others will pick up on that as well and there will be a negative consequence for them, as a result. How do you challenge people to become more creative in their work, take on more ownership so they are not just “busy, but bored”? How do you ensure you are a true multiplier who does not accidentally diminish those around you? If you do diminish, what do you do and what can you do to help limit this? If you want more resources from Liz Wiseman, you can go here, here, here, and here. This entry was posted in Leading the Learning, Professional Development, Reflection and tagged BCPVPA, conference, Connecting, leaders, multipliers, reflection, Richmond, wiseman. Bookmark the permalink. 8 Responses to What Type of Leader Are You? Thank you for sharing your learning from the conference. I have been incredibly lucky in my years of teaching to have the Multipliers by my side, guiding, encouraging asking those difficult questions. The last three years has been a powerful time for me as an educator as my learning and leadership has grown exponentially due to the ‘leader’ in my world. You have posed some very interesting questions around my style of leadership. I can definitely see myself as a Multiplier and Accidental Diminisher. I too wish to fix things and make them all better, as that is my nature. It is interesting though to note that as I am shifting my teaching style in the classroom, pushing for independent thought, problem solving, choice in making decisions, my leadership style with my colleagues is also beginning to make the shift. Many questions are now swirling in my mind about who I am as a leader; thank you for that. How wonderful that you have always had great leaders by your side to support and nurture your learning and the learning of others. That is a real gift! You are right, as our teaching shifts, so does the rest of us – who we are as leaders and even who we are as people. It is such a ride, isn’t it? Thanks for your interesting post about what looks to be an interesting book. I think it is important to remember that relationships have at LEAST 2 perspectives involved. The “Leader/Follower” paradigm itself can be perceived as a “multiplier” to one and yet a “deminisher” to another. I think that before we drink the “Leader/Follower” kool-aid, we would be wise to consider other collaborative models and then encourage the use of the one, or combination(s), that are best for us (emphasis on “us”). Which collaborative model or combination of models might be most effective given the nature of the participants and their objectives? Which model or combination of models might be most consistent with the rights and values already protected, promoted and expected by citizens in our modern democracy? In our modern democracy, do we want to promote “Leadership” as a destination/aspiration, in itself, for our students/citizens? Or in this “21st century” do we want to model, teach and promote more distributed/matrixed, more networked, more collegial, more collaborative, more mutually respectful, more efficient, more effective, more robust ways of collaborating? The more I witness the obsession with “Leadership” in BCEd, the more I witness the naked desire to be labeled a “Leader” in BCEd, the more I witness those actively appealing to and marketing to those who desire to be labelled a “Leader” in BCEd, the more I witness those who self-label as “Leaders” in BCEd, the more turned off the “Leader/Follower” model I get. There are other models of collaboration that exist, and can be developed, in addition to the currently popular “Leader/Follower” paradigm. Our citizens (past, present and future) and our students deserve, and need, a continuously evolving and improving BCEd system. Governance and administration of BCEd needs to evolve and improve every bit as much as curriculum & pedagogy needs to do the same. I think BCEd would benefit from a closer examination of these issues. I agree with you in many respects. The entire education system in BC should be continuously evolving and improving. Just as the teaching approaches should be examined, so should our approaches in leadership – both formal and informal. One does not have to have a formal leadership title to be an actual “leader” in our system. In fact, I would say that the most important, most influential leaders in our education system are those who do not have a leadership “title” at all – the teachers in our system are the most important leaders we have. Do you have issue with anyone being called a “leader” – even informally? Would the word “mentor” be more appropriate? Or, how about the term “collegial colleague”? I agree, it is much more to me. As an elementary administrator, I look at my role as being important, but one where I work with my colleagues in my school to do our best to do what’s best for kids. We work together, collaboratively. I do not have all the answers. Not even close. We need to work together in a collaborative manner to create the best system we can. One of the most difficult lessons I learned when I first took on the role of vice-principal was that I was now different. People perceived me differently because I now had a “title” even though I was saying the same things and felt the same way about kids. People just saw me differently. At first, this was very difficult for me to understand because I was “still me”. To others, though, I was different. It was not an “us and them” kind of mentality for sume – not all. I do not take this personally anymore, but it can still be difficult. I agree, THIS needs to change so that we are not seen as adversarial. There needs to be a much more foundational trust built that does not depend on “title” of leader so that we can all work together to best meet the present and future needs of our students. Is this what you are thinking? Do you think this is possible? Thanks for taking the time to read my post and make such a thoughtful, reflective comment. I appreciate that! I’ve discovered that wonderful things happen when I stop talk talking. When I stop trying to fill that awkward silence after a student does not immediately respond, the student eventually does. Yes, listening is so very important in all we do, as teachers, as parents, as friends, and as spouses, etc… Many people just need time to process what was said and then time to generate an appropriate-for-them response. It’s so important to give them the gift of time to allow this process to take place. At that workshop, Liz talked with us about the importance of asking questions. She posed an interesting question, “Do you think you can solve a problem by only asking questions?” She gave us an interesting example and some great exercises. I think she really made us all exerience the importance of questions. Not only do we need to be comfortable with the awkward pause, but we also need to become comfortable not giving the answers. Saturday morning blogging bonus! Your thoughts on leadership and learning caught my attention, sharing your personal thoughts about the book ‘Multipliers’, and how you assessed yourself within these ‘disciplines’. This book is now on my must have list! I proceeded taking the survey on Liz Wiseman’s site to find out where I was on the Diminisher and Multiplier continuum which provided clear feedback. Beginning my first year as an elementary principal, with colleagues I’ve collaboratively taught with for the past 15 years, has required a great deal of leadership reflection. Balancing the leadership role with trust, inspiration, encouragement, and steering the ship with confidence has been an amazing journey. However, it is only October and keeping my leadership toolbox well stocked is critical for professional growth. I am looking forward to following your blog and tweets.